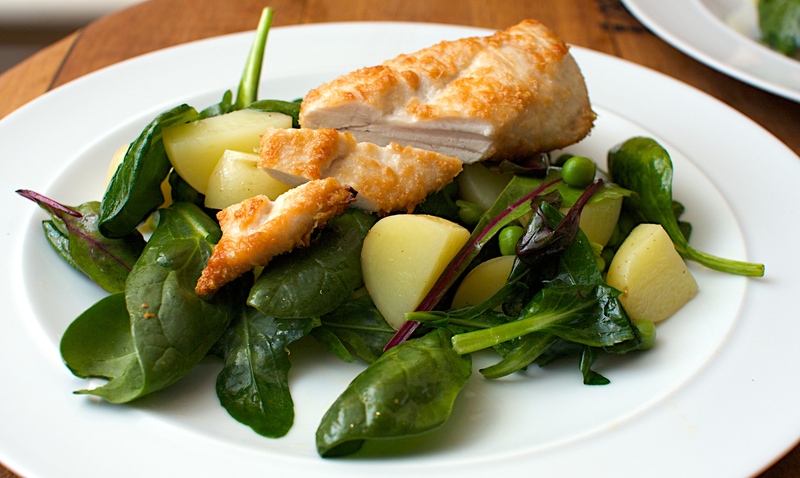 This is a quick and easy week night supper with great spring flavours and nice moist chicken. Perfect now we’re into the long nights, even if they’re somewhat frosty still. Heat the grill to medium and line the grill pan with foil. Beat the egg white on a plate with some seasoning. Tip the Parmesan onto another plate. Dunk the chicken in the egg white, then the cheese. Grill the chicken for 10-12 minutes, turning once until brown and crispy. Meanwhile, boil the potatoes for 10 minutes, adding the peas for the final 3 minutes, then drain. Toss the vegetables with the spinach leaves, vinegar, oil and seasoning to taste. Divide between warm plates and serve with the chicken. Wine Suggestion: Any light white you have in the fridge would go great here. If you’re going out to buy it try a Rhône varietal, like Roussane or Marsanne.